During an operations session on my Utopia Northern model railroad, we got into a discussion of locomotive weight and pulling power as a Proto 2000 2-6-0 spun its drivers trying to get up the ruling grade from Underhill North to Collings Woods. The grade was about 2% on a curve through a mountain. "Pulling the train is all about ratios. On a diesel, with 36" wheels, and a gear ratio between electric motor and wheel of, say, 10:1, the wheels will turn 1/10th of their circumference for every complete revolution of the electric motor, which is pi x the diameter of the wheel divided by 10, or 36 x 3.1459 divided by 10 equals 11.3". On a steam locomotive, with, shall we say, 66" wheels but the same electric motor, the numbers are 66 x 3.14159 divided by 10 equals 20.7" which means the steam locomotive needs almost twice as much power to move the same weight." I don't know if the manufacturers take this into account when they gear the the drive shaft to the wheels, but suspect it gets too complicated to manufacture gears of smaller diameter for the steam loco. In theory, a steam loco with the same gear ratio as a diesel should go almost twice as fast but only be able to pull half as much. Also, some of the diesels we use on the Utopia Northern layout to pull the trains have 12 driving wheels. The biggest steam loco has 8, which provides an additional 50% traction for the diesels. Loosely speaking, the diesels should pull about 2 or 3 times the weight a steam kettle can". Adding weight above the drivers on a steam engine helps, but it is usually very difficult to find space, even if you can find some moldable weight. An alternative is adding traction tires or Bullfrog Snot which acts as a traction tire. However, this reduces the number of drivers for electrical pickup. I have not used these methods. The locomotive weight also has a direct correlation to the weight of the cars that you're trying to pull. Grade and track curvature also influence what happens. In the model railroad world we can't pour sand on the rails to help traction. This all adds up to some interesting operations possibilities. 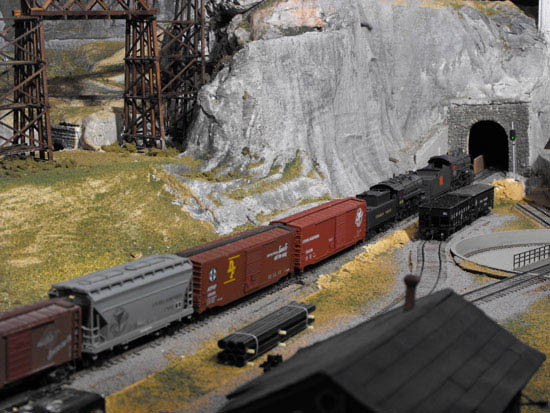 Doubleheading locomotives is much easier with DCC than with DC and it is possible to match the characteristics of locomotives by changing CV values. Even when two locomotives are mismatched it is still possible to get the train up the grade. We began keeping a "helper" on permanent duty at Underhill North to assist trains up to Collings Woods and another "helper" at Underhill South for the big hill (helix) up to Buffalo Peak. The locomotives needed to be cut off at the top of the grades and returned to their starting point. If necessary, we could cut in a diesel as a pusher for more variety. The alternative is to cut the train in half and double the hill. I'm not sure what will happen on the new UNRR when operations get underway. 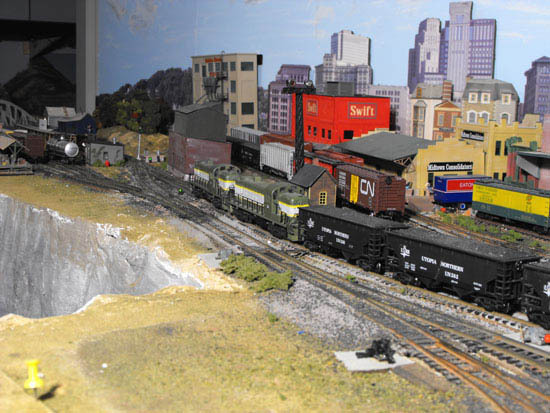 Some of the grade are steep and trains may be limited to 8-10 freight cars. All these approaches add interest to an operating session. Another train we operated was a coal drag that usually had two RS3 diesels up front although sometimes we ran it behind steam power. The locomotive weight of the diesels is certainly better than my largest steam. Martin's musings put a whole new "spin" on the subject of locomotive weight and traction effort. Return from "locomotive-weight" to weight overview. Return from "locomotive-weight" to my Home Page.